Teriyaki is a traditional Japanese recipe and is widely enjoyed at home as well as at restaurants. However if you image the type of teriyaki you know from neighborhood teriyaki joints, you might find the Japanese teriyaki less…sweet. The recipe calls for sugar, yes, but not to make the sauce syrupy. It should be a good balance of soy sauce and sweetness coming from sugar or mirin. Additionally, teriyaki originally was the sauce mainly for fish in Japan. Fatty fish such as buri (yellowtail) is most popular for this type of cooking, but salmon is also a favorite for Japanese teriyaki. Living in the Northwest, salmon is the most accessible fish these days, so I picked the fish for my teriyaki bento. 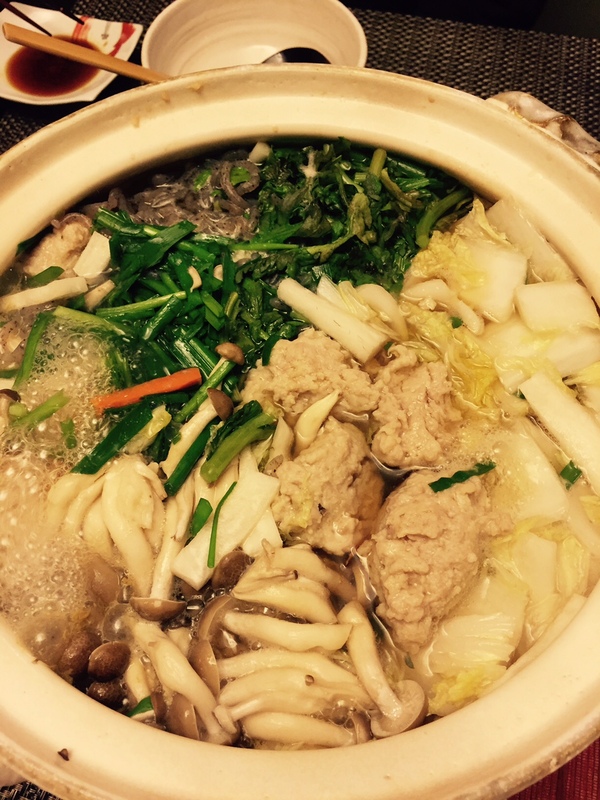 I am hoping many of you will enjoy the dish along with many good vegetable dishes. And I really want to highlight those wonderful vegetables that I selected for the bento. I was excited to start seeing asparagus on the produce isle at supermarkets and couldn’t help grabbing a bunch for “shiraae”, a traditional salad with creamy tofu and sesame dressing. Feel the spring! 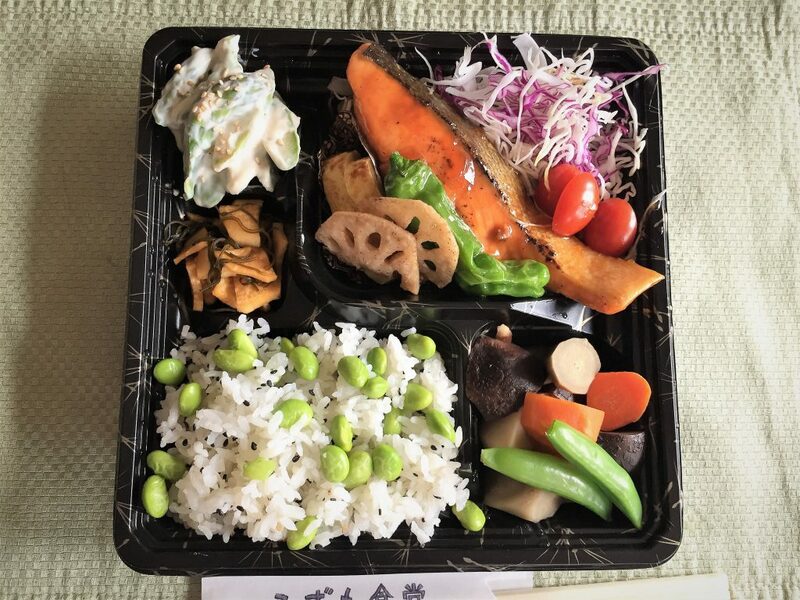 Also I made a dish with lots of good root vegetables such as gobo (rich in soluble dietary fiber), carrot, satoimo (a Japanese taro that enhances your immune system), dried shiitake mushrooms (wonderful source of Vitamin D). The detox vegetable stew! Do not forget by players for the salmon. Lotus root is a wonderful source of fiber (and another immune system booster), shishito pepper (source of Vitamin C), and cabbage (source of vitamin C and fiber!). And any bento should come with rice. I used Nishiki new crop and mixed with edamame and black sesame seeds. Yum. Wow, you can get a perfectly balanced meal from this bento. Hope you can enjoy my salmon bento next week! 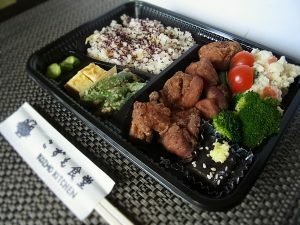 Order my bento at https://www.josephine.com/meals/authentic-salmon-teriyaki-bento. 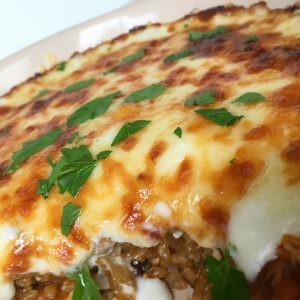 The meals of the week – Doria and Hamburger Steak! My first couple of experiences with Josephine have been great. Both Tonjitu + rice balls and Karaage bento were sold out, and I got very positive reviews at both Josephine and Nextdoor. This week is a Yoshoku week. Yoshoku is a Japanese style Western food, and it’s the core of the Japanese comfort food culture. If you go visit Japan, you’ll be stunned to see how many yoshoku restaurants are around in town. 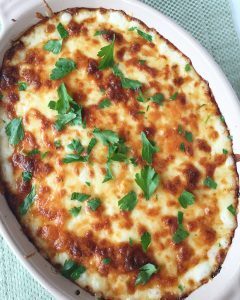 Doria is one of the all-time yoshoku favorites. It’s basically rice gratin with bechamel sauce and cheese on top of the casserole. If you still don’t have an idea what it is like try my chicken doria through Josephine this week on March 1! Also, hamburger steak is VERY popular. For most Americans salisbury steak might sound more familiar. If you ask Japanese kids if they like ham urger steak I could bet that 99% would say YES! So I decided to make a bento with a hamburger steak, with no-so-sweet teriyaki sauce and ponzu relish. How could it be more Japanese? 🙂 The bento will be available on March 3 through Josephine. 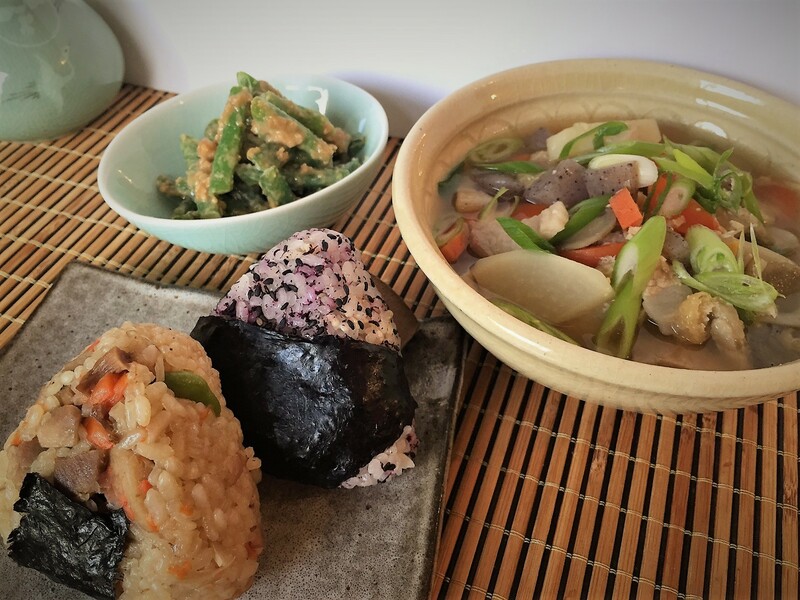 I hope you will enjoy the flavors of the Japanese comfort food Yoshoku at my kitchen! Karaage Bento is now available for dinner! Hearty Pork Miso Soup and Rice Balls for a busy weekday dinner? As my introduction to authentic Japanese home cooked meals, I picked a miso soup and rice balls, both of which are the core of our comfort food. I hope to meet many neighbors through my food! 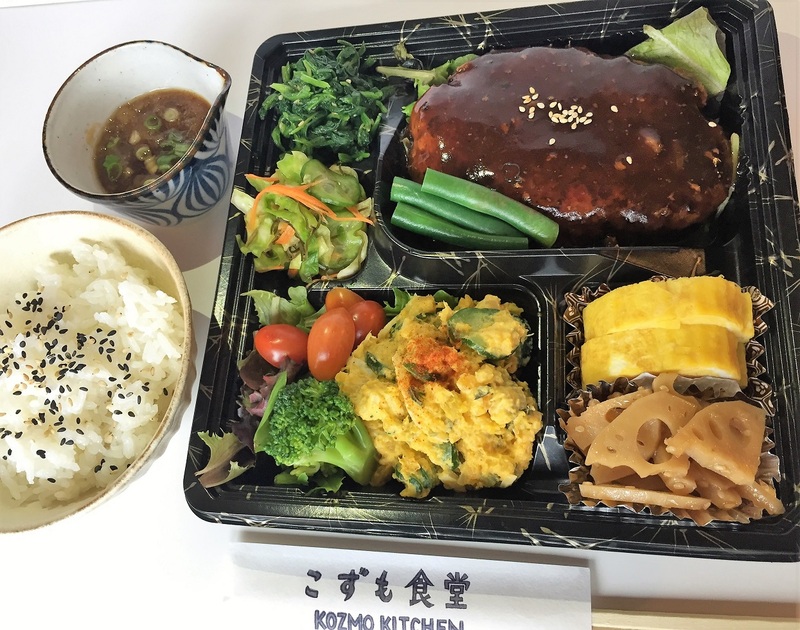 Are you interested in trying an authentic Japanese bento this week? Everything is made from scratch with all fresh ingredients, and it’s delicious! I am Kanako from Kozmo Kitchen, a personal chef and cooking instructor (currently teaching at PCC Cooks), specializing in Japanese home cooking. 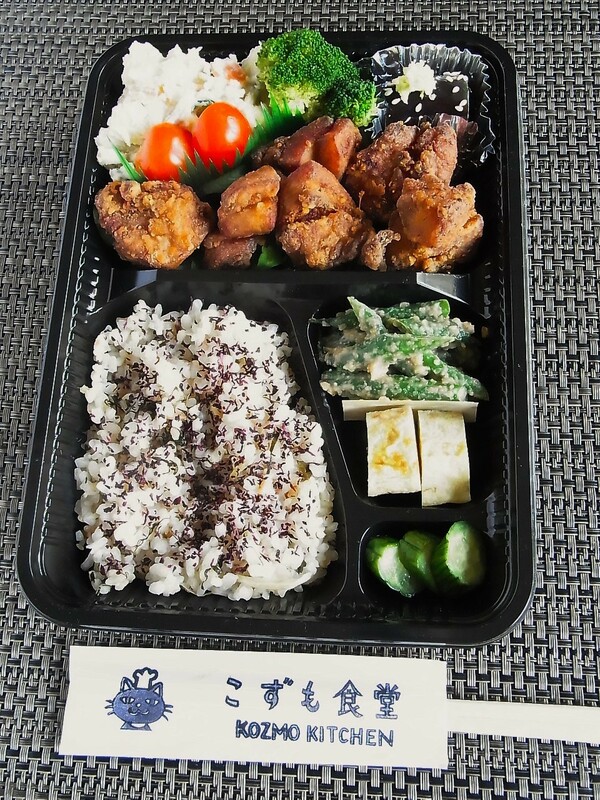 This Wednesday, I will deliver Chicken Karaage Bento to a few Microsoft buildings. Here are the order details. – Note: Contains meat (chicken), eggs, no dairy. Contains wheat in soy sauce. Hope you’ll enjoy the taste of Japan! Finally! I will start my bento delivery services next week (probably on Wednesday). It’s sort of a trial project at this point, and there will be some adjustment and improvement as I go. Stay tuned for more details! Or contact kozmokitchen.gmail.com for more info. 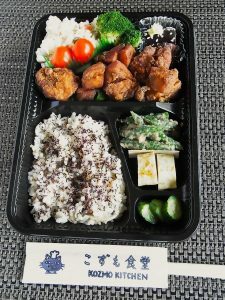 The bento for next week (the date is TBD) is Karaage Bento. The delivery locations will be a few buildings on the Microsoft campus. If that goes well, I might be able to expand delivery areas to Seattle such as downtown, Fremont, etc, but I’ll need to use some help to arrange the delivery locations. Note: Contains meat (chicken), eggs, no dairy. Contains wheat in soy sauce. It’s fall. Everything tastes better. But if you live in the Northwest, Matsutake is the king of the fall flavors. Its aroma is just mesmerizing and makes you so happy and grateful. I am not a mushroom hunter but luckily have some wonderful (and generous) friends that delivered hand-picked local matsutake to my house!! If you don’t have such friends, you can check out any Asian grocery stores nearby. I am pretty sure they have matsutake available now but hurry! The mushrooms will not last long. 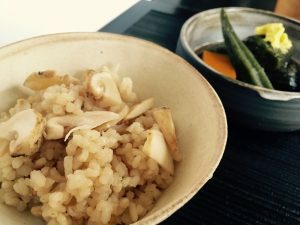 Here is one of the matsutake recipes you can try and enjoy within an hour. It's Matsutake season! You can't let the fall go without trying the mesmerizing aroma of Matsutake! Love living in the Northwest! Clean matsutake with damp paper towel if you see any dirt. You can shave off the very bottom of the mushroom if it's too dirty. Slice matsutake mushroom stems, and tear the stump by hand into small pieces. In a Dutch oven or any deep pot you have, put in the rice and add dashi, soysauce, sake and salt. Add in sliced matsutake. If you have an electric rice cooker. Note: If you have an electric rice cooker just cook the matsutake rice with all the ingredients as you normally cook rice. Place the pot, turn on the heat over High and wait for the liquid to start boiling. A lid is not required. Turn the heat down to simmer, put the lid on if you haven't done it yet, then cook for 12 minutes. Turn off the heat then but do not remove the lid yet. Wait for 15 minutes. Open the lid and fluff the matsutake rice! Don't pass out with the incredible aroma! 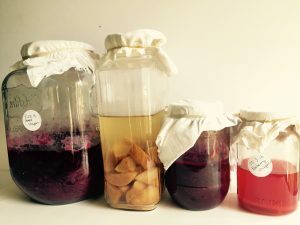 At the Living Well Health Fair hosted by Keiro Northwest, I will do a cooking demo on easy recipes using accessible fermented foods in your everyday life. It’s a free event. Stop by and say hello! There will be lots of great resources on overall heath and well-being. The event details are here. My PCC Nabe classes are all sold out! But do not worry, I’ll come up with more classes available in your own home kitchen. Stay tuned!